Nando's opens second restaurant in Stoke! Read more about Nando's opens second restaurant in Stoke! Nando's heading to Burgess Hill! 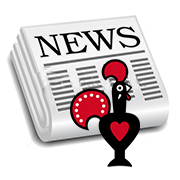 Read more about Nando's heading to Burgess Hill! Third Nando's heading for Oxford! Read more about Third Nando's heading for Oxford! Read more about Nando's heading for Clydebank! Nando's on the way to Stratford-upon-Avon? Read more about Nando's on the way to Stratford-upon-Avon?